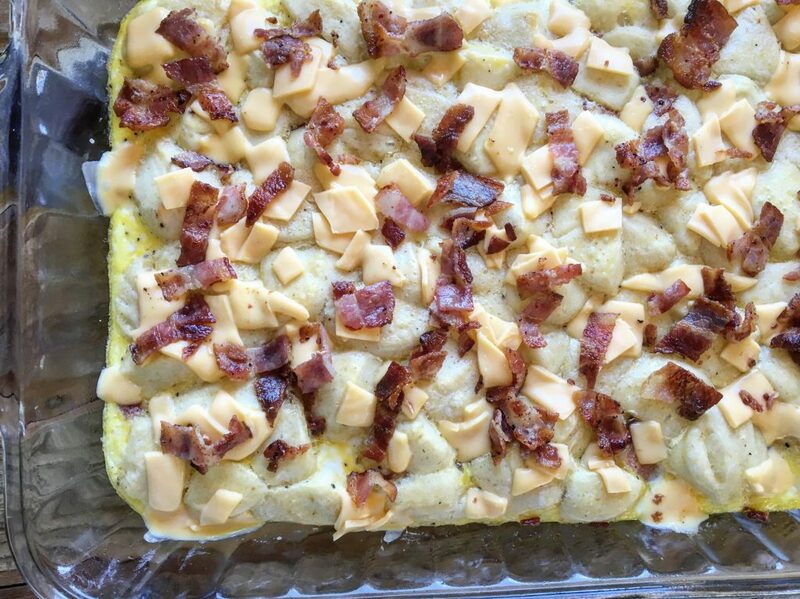 This Bacon, Egg, and Cheese Biscuit Bake is easy to make and delicious to eat! 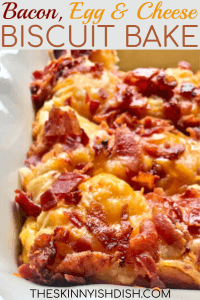 It’s full of refrigerated biscuits, whole eggs, crispy center cut bacon, and topped off with just enough cheese. 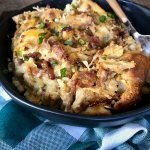 It’s pretty darn perfect for a holiday breakfast or brunch! Have I ever told y’all how much I love breakfast? I’m not sure if I have, so here it is: I LOVE BREAKFAST. It’s so simple, yet so scrumptious. 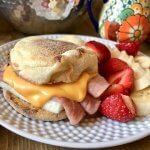 I feel like when living a healthier lifestyle, breakfast foods are the one thing that you don’t have to change too much… You can still have your bacon, and eat it too! 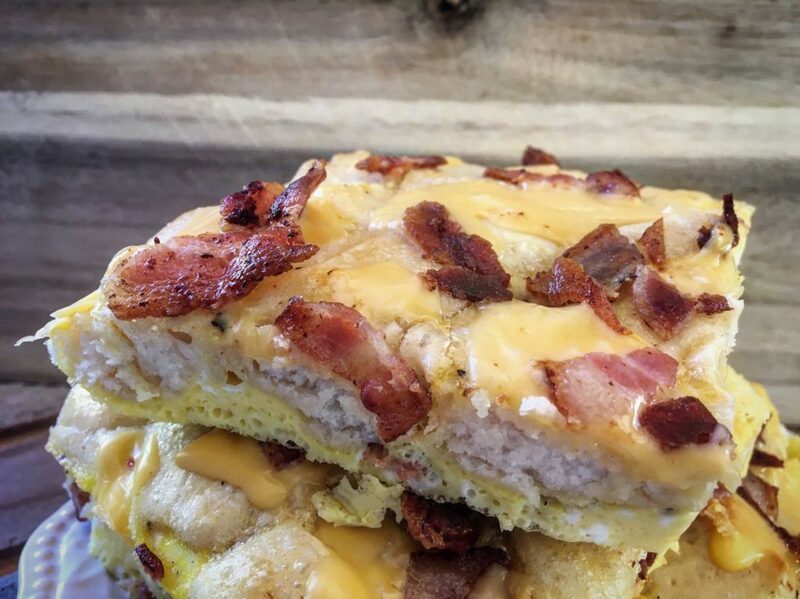 Anyway, I’m sure if you are here now, you’ve most likely tried or at least heard of my “Almost Famous” Biscuits N Gravy Bake . Now that one was truly a masterpiece and completely born out of crazy hungry breast feeding hormones when I first began Weight Watchers back in October of last year. I feel like nothing can top that. I feel like I may have hit my peak in the breakfast world. Don’t worry though, I never stop trying. 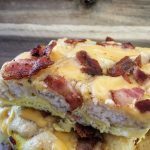 I’ve become used to having either the B&G Bake or my Cheesy Sausage Hash Brown Bake for breakfast just about every single morning of my life, and I love it! So does Pepper, but I’ve got this handy dandy thing called a food blog now, so I need to keep trying new things, and also try to remember some of the breakfasts I used to make before these two delicious bakes. When it comes to breakfast, I like it savory 99.9% of the time. 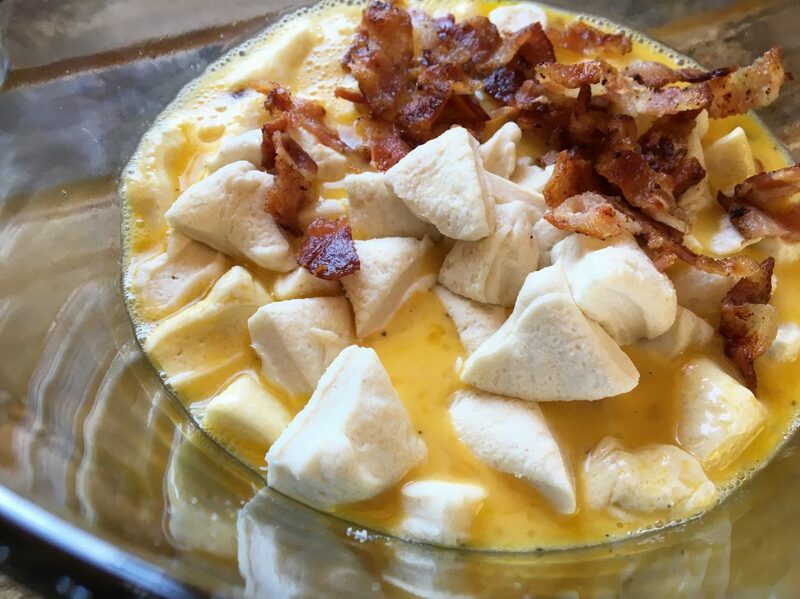 Give me eggs, give me bacon, give me cheese. 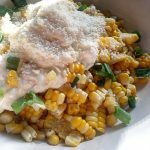 And this recipe here includes all things hearty and savory. I have a confession… like a really legit confession. I seriously love Mcdonald’s Bacon, Egg & Cheese Biscuits. I feel like admitting that basically makes me look like I have no idea what I’m talking about when it comes to flavor, but trust me, I do. My palate ranges from an animal cracker dipped in peanut butter, to a pretty plate of Chicken Saltimbocca with a garlic white wine sauce. On a side note: I’m laying in bed typing this and I turn to Eric to ask him how to spell “Sambooca” and he’s says s-a-m-b-u-c-a and I’m not like no, that’s not right. I’m talking about Chicken Sambooca, not the russian liquor. So I google it real quick and realize I’ve been pronouncing Saltimbocca … Sambooca for the past 5 years. Full Disclosure: I make words up entirely too much. Extra Full Disclosure: I will most likely continue to call it Sambooca for the rest of my life. These are the reasons Eric loves me so much. I know this. I honestly don’t even know why I am talking about Chicken Saltimbocca (Sambooca). I need to go bed. 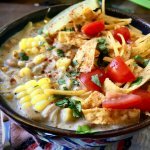 But, not before I give you this brand spankin’ new delicious recipe from the skinnyish dish kitchen! Where was I? Oh right, I remember now. 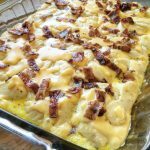 I love Mcdonald’s Bacon, Egg, and Cheese Biscuits, and this breakfast casserole tastes IDENTICAL… and it really, really makes my belly happy. It’ll make yours happy too, alright? Now here’s what ya do! Grab seven eggs, 3 tbs of milk, and some salt and pepper, and whisk your little heart out. 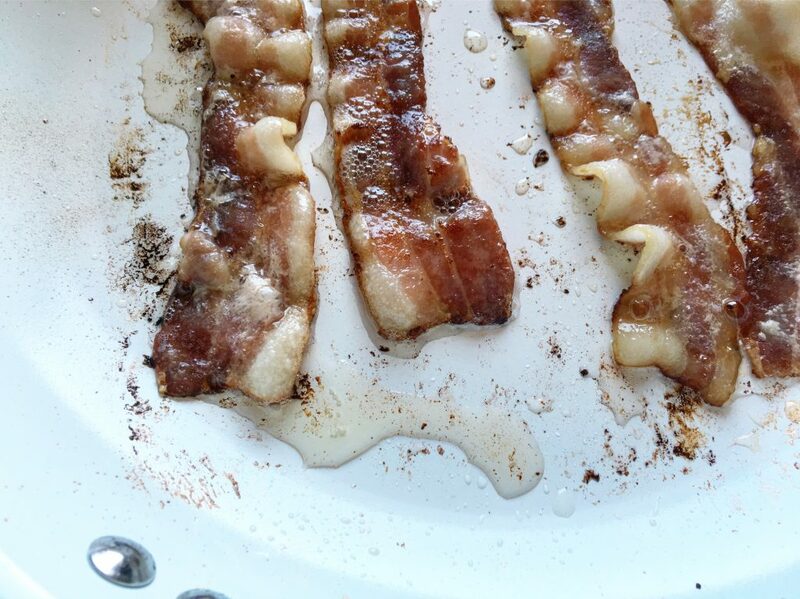 Fry up 8 slices of bacon until crisp! Mmmmmmm Bacon is my favorite. Chop up the bacon. Try not to eat a couple little pieces. I failed. I ate a few or five. Also, cut 15 refrigerated biscuits into small pieces. Toss in about half the bacon and all of the cut up biscuits in with your eggs. Spray a casserole dish with cooking spray and pour in the mixture. Pop in a preheated 350 degree oven and bake for 15 minutes. Grab some good old fashioned American Cheese! I personally think this is what really makes the bake taste so delicious. Feel free to use a different type of cheese if you aren’t a fan though. I won’t take offense! 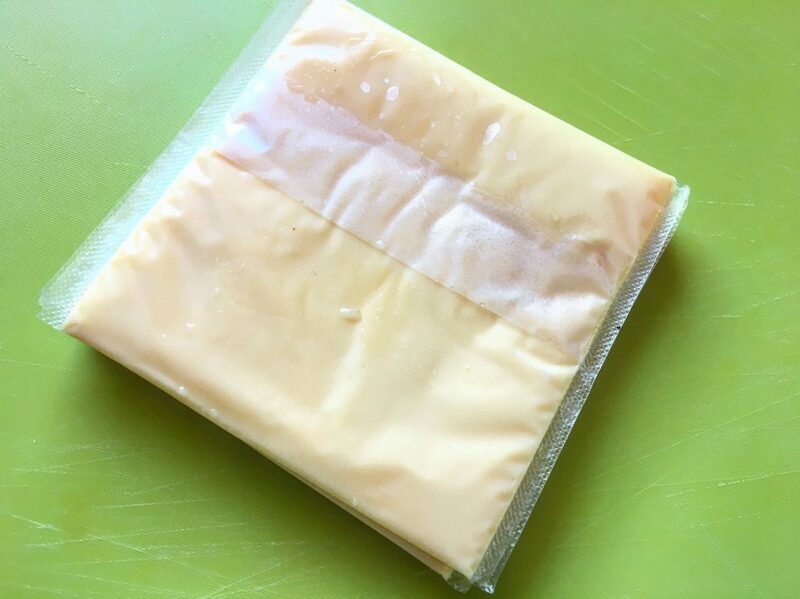 These are American cheese slices made with 2% milk. I’ve used shredded reduced fat cheddar and it tastes perfect. Chop into small pieces. 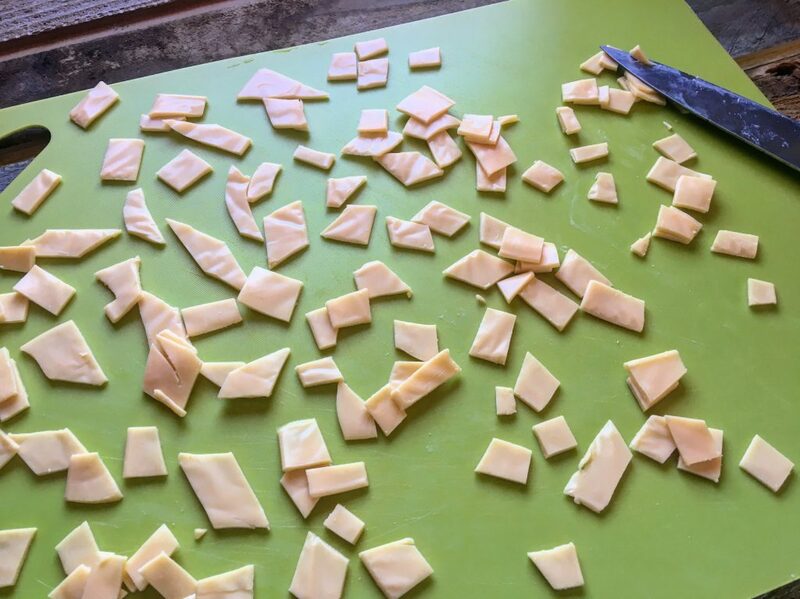 This is actually the hardest part about this entire recipe because it’s tedious and American cheese likes to stick together. This is where shredded cheese might be more your cup’a tea. 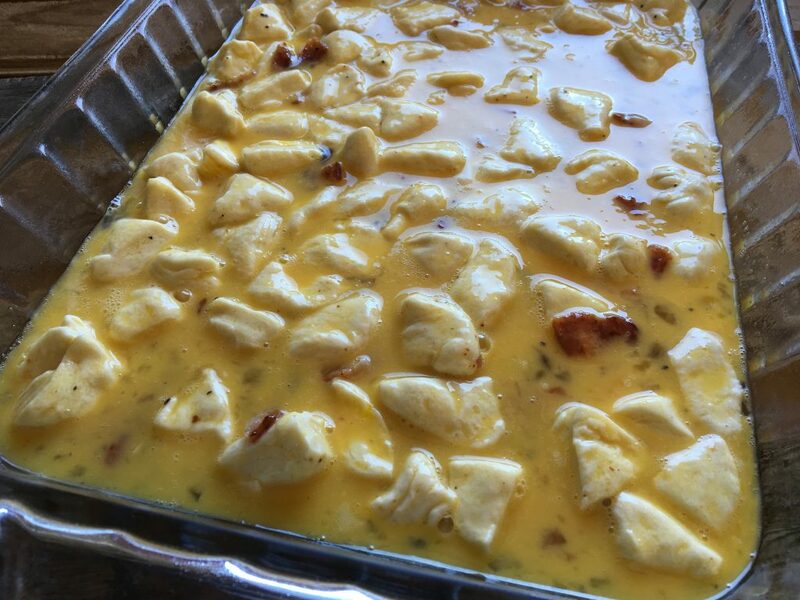 Now grab the bake out the oven and top with cheese and the rest of your bacon! MMMMM. Pop back in to the oven for about 5 minutes. Here we are. 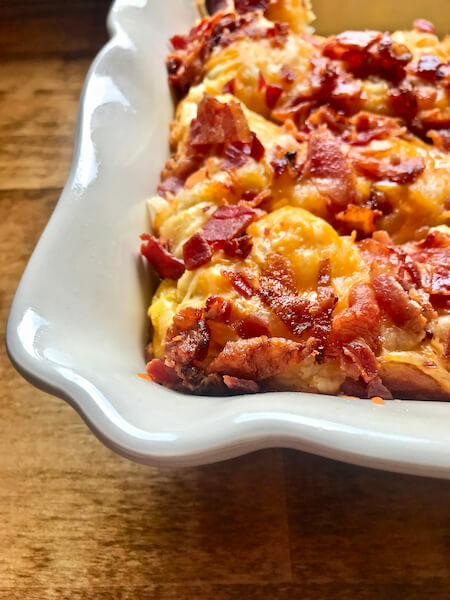 You’ve got yourself a delicious, lighter on calorie, homemade bacon, egg, and cheese biscuit in the form of a casserole that everybody’s gonna love. Here’s how the bake looks with shredded cheese too. 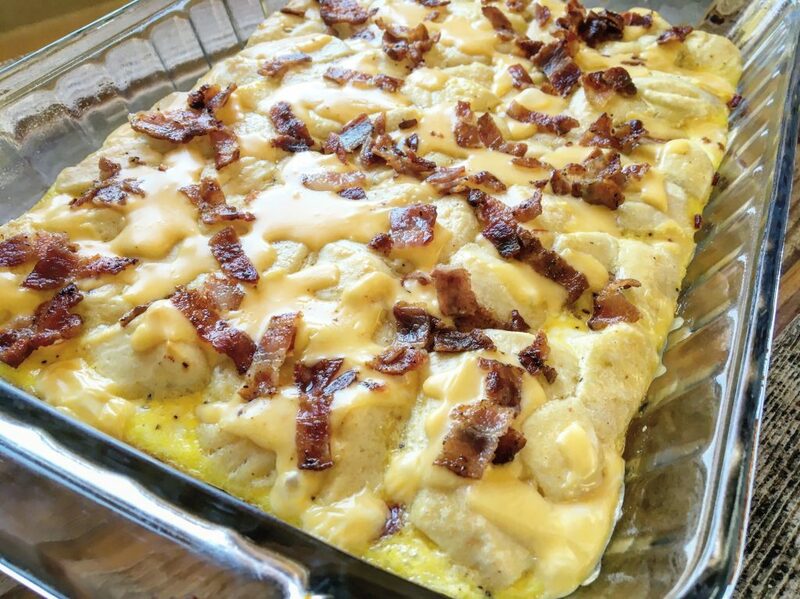 A deliciously lightened-up casserole layered with biscuit, eggs, cheese, and bacon. Fry up 8 slices of bacon. 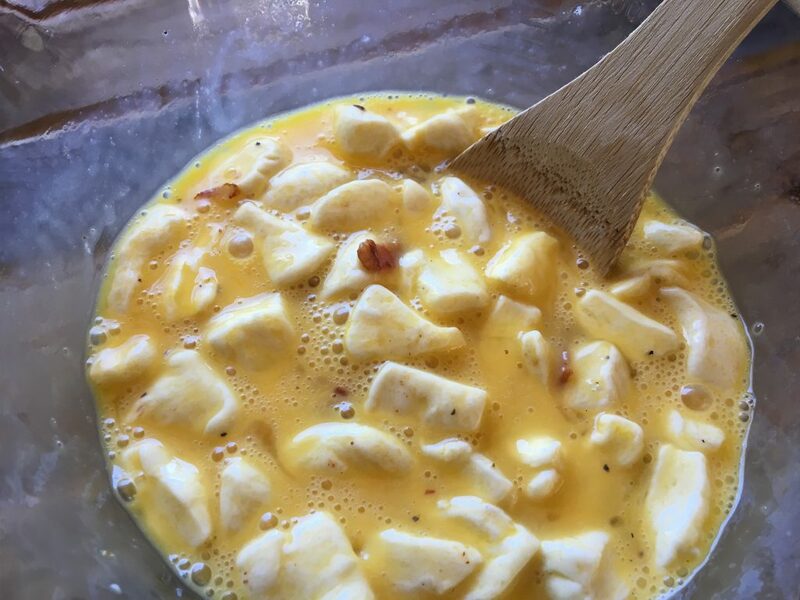 While the bacon is cooking, In a medium bowl whisk together eggs, milk, and salt and pepper. 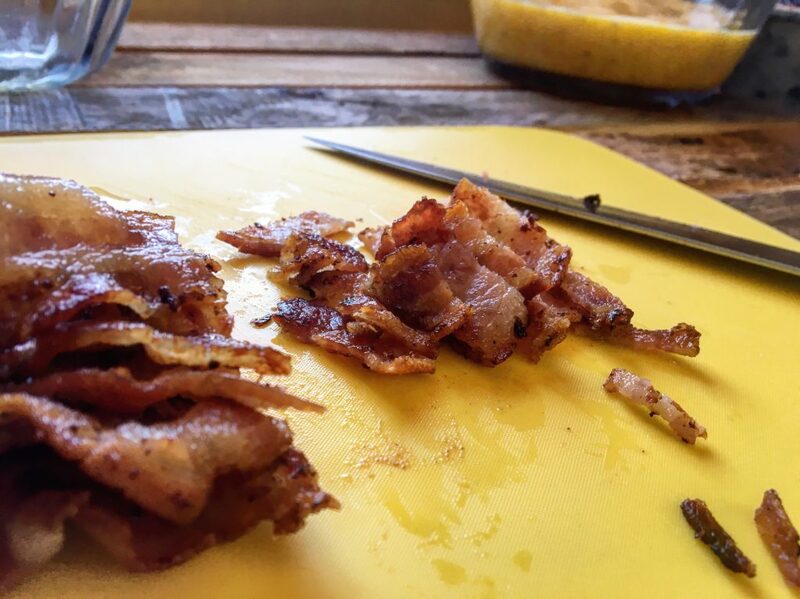 When the bacon is done, chop up into small pieces. Add 1/2 the bacon and all of the cut up biscuits into the bowl with the eggs and stir together. Pour into a lightly sprayed casserole dish and spread evenly. Pop into the oven, uncovered, for 15 minutes. Meanwhile grab 4 slices of American cheese and cut into small bite-size squares. Set aside with the other half of the bacon. When the bake is done remove from the oven and evenly distribute the cheese and the bacon. Place back in the oven for 5 minutes. Cut six servings and enjoy!! Serving size 1/6 of the pan: 5 Freestyle Smart Points. 8 Smart Points. 280 Calories. 12g fat. 3.5g saturated fat. 27g carbs. 1g fiber, 4.5g sugar. 17g protein. Hi! I’m a U.S. expat following you from Australia. Unfortunately, they do not do biscuits, so no refrigerated ones here. D o you think if I mixed up some drop biscuits that would work? I would adjust the points of course. Hi Amy, I think that should work just fine! I hope you love it. Can this be preassembled in the morning and then cooked at a later time (noon brunch)??? Thanks and can’t wait to try it! It was delicious even though I can’t follow directions! I made the mistake of not paying attention to the ounces of biscuits, instead I focused on the 15! My fault – it was still good but my own doing. That’s what I get for rushing when two small kids are afoot 🙂 I’ve been referring your website to my girlfriends as I love your recipes! Thanks Star! so happy you enjoyed despite the lil mishap! Thank you so much for spreading the word too! This was so good! We devoured it. Thanks for the recipe. 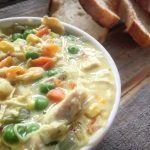 I have been making this on regular rotation and we absolutely love it – it is SO good and easy to have on hand. 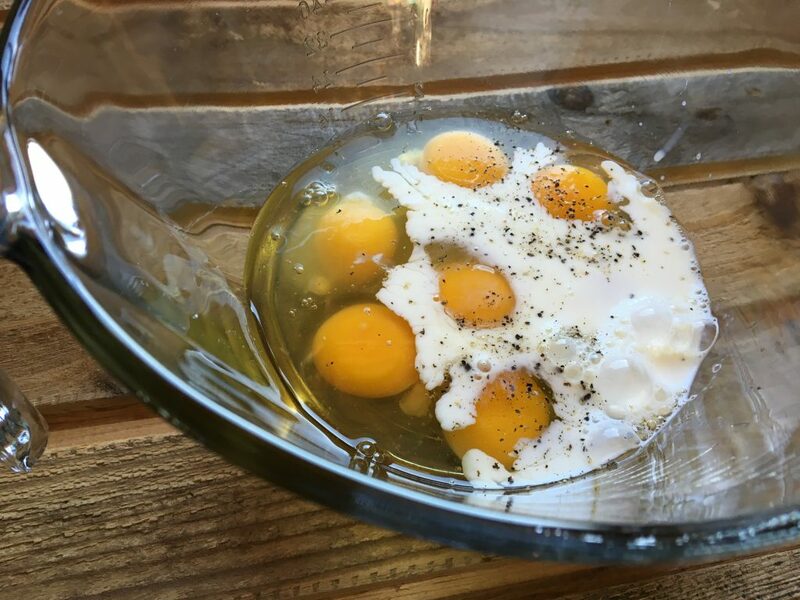 I JUST noticed though (because i was jotting it, and your main site link, down for a friend) that in the play by play, you say grab 7 eggs but in the recipe itself, you call for 8 (I’ve been making it with 8 all along LOL) No matter what, it’s a keeper – thank you! Hi Dani! OOPS! my mistake. I am pretty sure it is 7 with the nutritional information that I have, but if you’re following WW Freestyle it doesn’t matter. This looks amazing!! 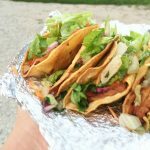 I meal prep each week, does this reheat well? Thank you! It does! I hope you enjoy! Yep – I agree with the 2 previous people. Putting all ingredients in recipe builder (Pillsbury biscuits = anywhere from 30-38 points), I’m coming up with 7-8 FS points per serving!! (I like to build my recipe BEFORE trying it just for this purpose). I adjusted the biscuits to Great Value brand (23 points for 15 biscuits) and using Velveeta american cheese slices (5 points for 4 slices) that brings it down to 6 FS points per serving. So with all these adjustments, I can’t figure out how you’re coming to 5?? Maybe you can list the name brand of bacon you use? Thank you! Are you using the biscuits that come 10 to a can? They are 7.5 ounce cans. 15 Points for the total can. (smaller than the average biscuit can) You can find them at most grocery stores. Great Value has a store brand, Aldi has a store brand, Jewel has a store brand, and Kroger has a store brand. Hope that helps! Hi star… I Used the jumbo biscuits and weighed them out. Comes up 38pts. I used fat free shredded cheeses 1/2cup 1 pt and Hormel cured 81 cubed ham 8oz for 5pts. Everything else same. And got 7pts per serving? I’m having trouble figuring out how this is 5 fsp per serving. Just entering in the recipe builder the 11.25oz alone of Pillsbury buttermilk biscuits = 30 points. That would be 5 fsp a serving, but it isn’t even counting the cheese or bacon. Any thoughts?? I’d try 10 eggs and 1/4 cup milk. I’m actually going to adjust this recipe to use all of the biscuits soon. So, I’ll have a definite answer then! Made this this morning and it was DELICIOUS!!! I did have to bake quite a bit longer than you, but it was TOTALLY worth the wait!!! So yummy!!! 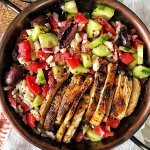 Thank you for always posting yummy meal ideas and for them being healthy too!!! Kudos to YOU!!! Star, I can’t find the points on this post, but I see you said you updated it. Can you tell me where it is listed? In the past I have lost 90# doing weight watchers. I have maintained this weight loss within 2-5# now for the last 8years. Decided to get back on the wagon with hopes to lose the remaining 30# I intended to do years ago. Have to say I have been doing your recipes on and off for a while. Just made this breakfast bubble up for the first time yesterday. Having my first piece this morning on this cold start to 2018. It is absolutely delicious and will be on my go to list. Thank you for the great recipes and all the work you do keeping the points up to date. Looking forward to also making the bruschetta chicken pasta this week for dinner. Happy New Year to you and your family !! Has this been redone with freestyle points? Just did it! I missed it. whoops! Has anyone done this with sausage or cubes ham ? I’ve done it with a bit of cooked and crumbled turkey sausage. Delicious! I’ve seen a few people do it with ham also. I love this recipe I’ve made it at least 6 times this year, but I can never get this one to cook right. At first I was using the tin throw away land and then I switched to a ceramic casserole dish which still didn’t help. When I take it out from the oven the first time it looks like it needs to cook for at least 20 more minutes. I’ve just been pulling it out and putting it back in to cook longer. Any thoughts on why this is and how I can fix it? Hmmm… I’m a bit stumped as to why this is happening. 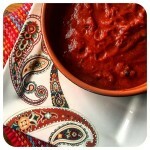 I switch between a glass pyrex dish and a ceramic one with all my recipes and it has always cooked up just fine. Ovens can run a bit differently no doubt, but an extra twenty minutes does seem like a lot of extra time for the oven to be off a bit. I’m sorry it’s happening! I wish I could be a little more of help, I have this on my meal plan this week so I will triple check the time, but I haven’t had feedback like this from anyone else yet so I think the time/temp should be on point. I’ll get back to ya! I used all 3 cans Buttermilk Biscuits, not paying attention, I didn’t weigh the amount I was supposed to used, How many points is a serving? When I input this into my WW recipie builder (I used skim milk) it came up as 12 points I used shredded cheddar cheese too instead of American, but cheese should be relatable with point value. I’m just not sure where I went wrong. However, I made it, ate it this morning and it’s YUMMY!! I have my breakfasts prepped all week! Hi there! I am so so happy you enjoyed. 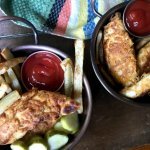 I double checked my recipe builder and everything seemed to check out still. How much and what kind of cheese did you use and what sort of biscuits did ya use? I’ll check it out! So sorry it ended up so many points. buuuut, at least it was so many delicious points! Looks delicious. I’d like to separate into serving sizes and freeze. Does this freeze well? What size of pan did you use for this? I’ve made it in 9×13 casserole dish mostly, but i’ve used a smaller casserole dish and it worked just fine. I can’t wait to try this! Any thoughts on using egg beaters? I think it would taste good, just not as rich. I have also found when using egg beaters you may need to cook it a few extra minutes. I would use 2 cups egg beaters. Next time I make it I will use egg beaters for sure and I’ll report back!